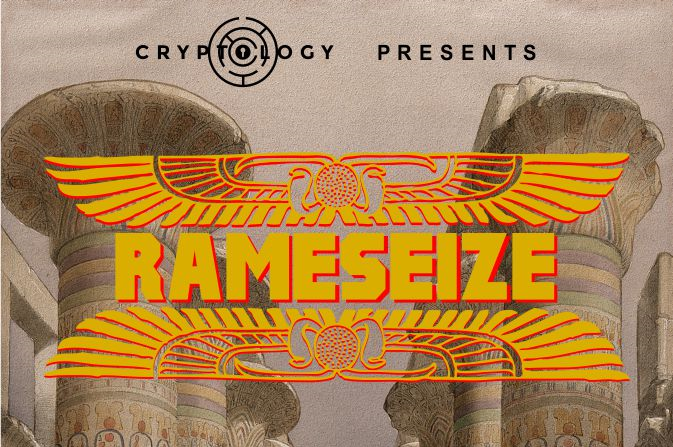 Cryptology has been around for a long time – opening their first game in mid-2015 and undergoing a significant revamp last year to create a new version of their Cypherdyne room and a completely new Egyptian experience, Rameseize, which was the reason for our visit. The game starts with an in-character GM who sets the scene for the mission ahead. And it is very much a mission-based game, with three separate goals for you to chase. It’s great to see companies providing a variable challenge to cater for all experience levels. Often that’s little more than a token effort with a couple of extra puzzles thrown in to satisfy experienced players, but here it felt like the additional challenges represented a good proportion of the game both in terms of floor area and of puzzles. The introduction over, it was time to investigate the tomb. It’s a pretty set that, while not up there with the best Egyptian games I’ve played, is more than enough to carry the theme. Something I really liked about this experience was the sense of exploration. There are different-sized spaces to move through, each of which has its own feel; and each time I came to a new space, I was keen to explore. They’ve also managed to give a feeling of remoteness – by the time you reach the farthest point into the game, there’s a genuine sense of having explored your way through the tomb to reach your ultimate goal. A big complaint that I had with their previous iteration was a feeling that some elements of the game were quite repetitive. Not here – there was a far more even split of puzzles, and I never felt disappointed with the variety of challenges presented to us. I really enjoyed some of the puzzles and was pleased to see some physical challenges with chunky props to keep me occupied. There were also several predominantly mental challenges which made use of tangible props to enhance the puzzle. Yes, you could have solved the same puzzle without requiring those props, but how much better to have something you can physically manipulate! Things were going really well with this game until we reached the final few challenges, where we hit two problems. One was a set of physical props that were so worn it was hard to solve the puzzle. It was meant to be pretty difficult but, even once we’d worked out what we were meant to do, it took a lot of trial and error to find the right solution. The joy of a puzzle is in spotting the solution. Having to spend a big chunk of time trying stuff out after that took away a lot of that satisfaction. The other issue I had was with the penultimate puzzle, something that I know they were still working on perfecting when we visited. In theory it was a fun puzzle but, again, once we’d worked out what to do, we really struggled to get the correct solution (and not in the way they’d intended to make it difficult). The end result was that almost the final action in the room was pretty frustrating, and we solved it more by fluke than by skill. The good news is that the final challenge is fun, bringing the experience to a good close in a frantic way that ensures your adrenaline levels are up when you burst out of the room. With the exception of a couple of puzzles near the end, I really enjoyed Rameseize. The decoration is more than good enough, the puzzles are good and varied, and the multi-level challenge is a great way of catering to all teams. It’s such a shame that those final two puzzles proved to be a bit frustrating, because the rest of the game was much smoother. I have faith that they’ll continue iterating on at least one of them until they get the balance right. Our team of two escaped the room in around 55 minutes having taken help on a couple of puzzles via a thematic clue system. I’d suggest that it’s a reasonably tough challenge for two unless you’re happy to take clues but would suit a team of 3 or 4 well.